There are two honey locusts in Seething Gardens, a short walk from the Tower of London, towards the right hand side from the entrance. These are made easy to identify because they have plaques in front of them saying what they are. There are also acacia trees on both extremes and you might like to note the similarity between the acacia and the honey locust. Both have oval shaped leaves, arranged in pinnately compound order (see section on tree identification). 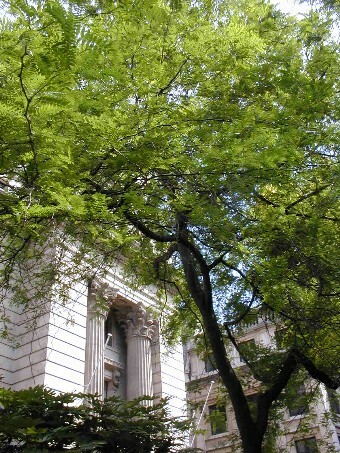 It is only the size of their leaves which differ; those of the honey locust are about half the size of the acacia. In fact, the other name for the acacia is black locust. The honey locust is used for producing honey but, generally, honey derived from the acacia is considered better. The honey locust comes from North America. click picture for full view.The mausoleum like building in the background is the former Port Authority of London building. Pinnately compound, alternate; leaflets are oval shaped, light and small: about half the size of those of the acacia tree. the flowers are not conspicuous. 3-5 petals arranged in bunches. 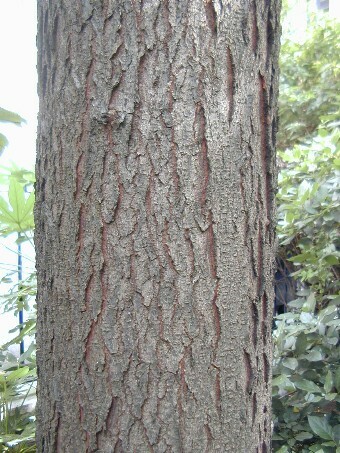 bark: rough, brown with strong ridges; a bit flaky. can grow to about 30 metres Generally long and thin. general: most of the ones in London are not more that 20 meters tall. Similar to the acacia but proportionally smaller in all factors.